RUSH: Now, Trump is not gonna go campaign for Roy Moore in Alabama, but he doesn’t have to. He doesn’t have to. All he had to do was endorse him, which he did, and that becomes immortalized in Roy Moore’s ads. So, I mean, this has got everybody shaken up. This has got the Drive-Bys, the establishment, they thought they were on the way to dispatching Roy Moore and getting rid of — well, chipping away at the Senate majority. You know, as long as Franken stays there, then we retain the opportunity to point out the hypocrisy of these people. I think Power Line, John Hinderaker or Hinderaker, I’m not sure who wrote the endorsement, but made a point, endorsed Roy Moore and basically made a point whatever Moore did was 40 years ago. They can’t find anything more recently than 40 years ago. Well, 40 years ago is when Teddy Kennedy left Mary Jo Kopechne to die and drown in the abandoned car. Forty years ago is when a couple of other things happened, and of course Ted Kennedy was able to live that down and prosper and triumph over it. And then of course another salient aspect of endorsing Moore is that the other guy is a Democrat. 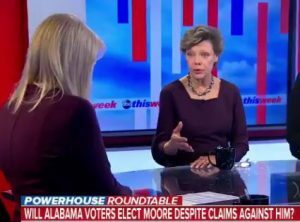 The media just hates that, when that is given as the reason for supporting Moore because his opponent is a Democrat, they try to apply a label of cheap and tawdry and partisan to people who will not denounce Roy Moore and who will in fact support him. Now, he doesn’t have universal support. Lindsey Grahamnesty and Carly Fiorina, some others, Tim Scott are suggesting that Moore should get out of the race and not run. But I actually think he’s gonna win now. You’re looking at me like — I think there’s a good chance Roy Moore could win. I think this is gonna upset conventional wisdom big time. And I’m not the only one. Let’s go to the audio sound bite number 6. Cokie Roberts yesterday on ABC — well, that’s how she says it. “Why do you say Cokie Roberts that way?” Look, I’m a mimic, and it’s not to make fun of people. It’s to be descriptive. Cokie Roberts, ABC News, Washington, while wearing the trench coat in the studio to make it look like she was outside in the rain. Cokie Roberts, ABC News, whatever, she was on ABC’s This Week, the roundtable. The Fill-In Host was Martha Raddatz. They’re talking about Trump saying that Alabamans should not elect Doug Jones ’cause the guy’s a horrible Democrat. ROBERTS: He doesn’t have to. And he also doesn’t have to go to Alabama. He’s done plenty for Roy Moore now. And Roy Moore can put it all in his ads, which he’s doing. And he’s clearly got the endorsement of President Trump. And without the endorsement of President Trump, he won the primary. I think with the endorsement of President Trump, it is going to be very hard to defeat him in the general election. RUSH: Now, stop and think about that for a second. With the endorsement of Trump he wins. That flies in the face of what the Drive-Bys are telling us about Trump and Moore. If you listen to them, Trump’s endorsement ought to kill Trump and Moore, not help either one, right? RUSH: Now we’re back in the saddle. Before I get to the phones and back onto the sexual harassment stuff with Conyers and Franken and the major hypocrisy. I can’t believe — well, I say I can’t, but actually I can. The Democrats are stepping in it big time here and their hubris and arrogance is telling them that they can get away with this. And they are misjudging this.